Securing privileged access is a critical first step to establishing security assurances for business assets in a modern organization. The security of most or all business assets in an IT organization depends on the integrity of the privileged accounts used to administer, manage, and develop. Cyber-attackers often target these accounts and other elements of privileged access to gain access to data and systems using credential theft attacks like Pass-the-Hash and Pass-the-Ticket. Protecting privileged access against determined adversaries requires you to take a complete and thoughtful approach to isolate these systems from risks. Before we talk about how to secure them lets define privileged accounts. Privileged Accounts like administrators of Active Directory Domain Services have direct or indirect access to most or all assets in an IT organization, making a compromise of these accounts a significant business risk. Why securing privileged access is important? Adversaries have demonstrated a consistent and ongoing ability to obtain access on workstations inside the network boundary through phishing and other web and email attacks. These factors necessitate building a modern security perimeter out of authentication and authorization identity controls in addition to the traditional network perimeter strategy. A security perimeter here is defined as a consistent set of controls between assets and the threats to them. Privileged accounts are effectively in control of this new security perimeter so it's critical to protect privileged access. A "blue" path where a standard user account is used for non-privileged access to resources like email and web browsing and day to day work are completed. Blue path items described later on indicate broad environmental protections that extend beyond the administrative accounts. A "red" path where privileged access occurs on a hardened device to reduce the risk of phishing and other web and email attacks. The roadmap is designed to maximize the use of Microsoft technologies that you already have deployed, take advantage of cloud technologies to enhance security, and integrate any 3rd party security tools you may already have deployed. Quick wins with meaningful positive impact. The roadmap is prioritized to schedule the most effective and the quickest implementations first based on our experiences with these attacks and solution implementation. Microsoft recommends you follow this roadmap to secure privileged access against determined adversaries. You may adjust this roadmap to accommodate your existing capabilities and specific requirements in your organizations. Securing privileged access requires a broad range of elements including technical components (host defenses, account protections, identity management, etc.) as well as changes to process, and administrative practices and knowledge. The timelines for the roadmap are approximate and are based on our experience with customer implementations. The duration will vary in your organization depending on the complexity of your environment and your change management processes. To help separate internet risks (phishing attacks, web browsing) from privileged access accounts, create a dedicated account for all personnel with privileged access. Administrators should not be browsing the web, checking their email, and doing day to day productivity tasks with highly privileged accounts. More information on this can be found in the section Separate administrative accounts of the reference document. Follow the guidance in the article Manage emergency access accounts in Azure AD to create at least two emergency access accounts, with permanently assigned administrator rights, in both your on-premises AD and Azure AD environments. These accounts are only for use when traditional administrator accounts are unable to perform a required task such as in a the case of a disaster. To mitigate the risk of an adversary stealing a local administrator account password hash from the local SAM database and abusing it to attack other computers, organizations should ensure every machine has a unique local administrator password. The Local Administrator Password Solution (LAPS) tool can configure unique random passwords on each workstation and server store them in Active Directory (AD) protected by an ACL. Only eligible authorized users can read or request the reset of these local administrator account passwords. You can obtain the LAPS for use on workstations and servers from the Microsoft Download Center. Additional guidance for operating an environment with LAPS and PAWs can be found in the section Operational standards based on clean source principle. As an initial security measure for those users with Azure Active Directory and traditional on-premises Active Directory administrative privileges, ensure they are using Windows 10 devices configured with the Standards for a highly secure Windows 10 device. Azure Advanced Threat Protection (ATP) is a cloud-based security solution that identifies, detects, and helps you investigate advanced threats, compromised identities, and malicious insider actions directed at your on-premises Active Directory environment. Continuing the process of separating privileged accounts from threats found in email, web browsing, and other non-administrative tasks, you should implement dedicated Privileged Access Workstations (PAW) for all personnel with privileged access to your organization's information systems. Additional guidance for PAW deployment can be found in the article Privileged Access Workstations. For Active Directory Domain Services (AD DS), use Microsoft Identity Manager (MIM)'s Privileged Access Manager (PAM) capability. 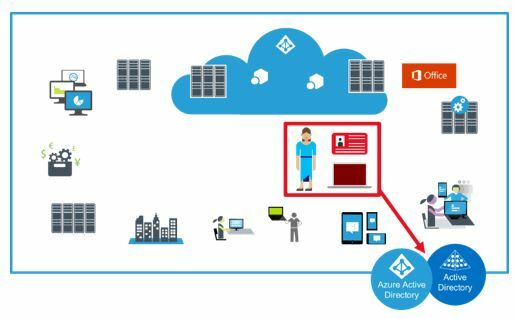 For Azure Active Directory, use Azure AD Privileged Identity Management (PIM) capability. Enabling Credential Guard helps to protect NTLM password hashes, Kerberos Ticket Granting Tickets, and credentials stored by applications as domain credentials. This capability helps to prevent credential theft attacks, such as Pass-the-Hash or Pass-The-Ticket by increasing the difficulty of pivoting in the environment using stolen credentials. Information on how Credential Guard works and how to deploy can be found in the article Protect derived domain credentials with Windows Defender Credential Guard. Enable Microsoft Azure AD Identity Protection to report on users with leaked credentials so that you can remediate them. Azure AD Identity Protection can be leveraged to help your organization protect cloud and hybrid environments from threats. Ensure privileged access account holders are using their PAW for administration only so that a compromised non-privileged accounts cannot gain access to a privileged account via credential theft attacks, such as Pass-the-Hash or Pass-The-Ticket. Azure ATP Lateral Movement Paths (LMPs) provides easy to understand reporting to identify where privileged accounts may be open to compromise. These capabilities will build on the steps from previous phases and move your defenses into a more proactive posture. This phase has no specific timeline and may take longer to implement based on your individual organization. Using the three tiered model outlined in the article Active Directory administrative tier model, review and ensure lower tier administrators do not have administrative access to higher tier resources (Group memberships, ACLs on user accounts, etc...). Harden your identity workloads including Domains, Domain Controllers, ADFS, and Azure AD Connect as compromising one of these systems could result in compromise of other systems in your organization. The articles Reducing the Active Directory Attack Surface and Five steps to securing your identity infrastructure provide guidance for securing your on-premises and hybrid identity environments. Integrating logging into a centralized SIEM tool can help your organization to analyze, detect, and respond to security events. The articles Monitoring Active Directory for Signs of Compromise and Appendix L: Events to Monitor provide guidance on events that should be monitored in your environment. Continue to enhance your security posture by enabling Azure AD Identity Protection to automatically force password resets when passwords are suspected of compromise. The guidance found in the article Use risk events to trigger Multi-Factor Authentication and password changes explains how to enable this using a conditional access policy. The bad guys never stop, so neither can you. This roadmap can help your organization protect against currently known threats as attackers will constantly evolve and shift. We recommend you view security as an ongoing process focused on raising the cost and reducing the success rate of adversaries targeting your environment. While it is not the only part of your organization's security program securing privileged access is a critical component of your security strategy.